iRefer is a referral marketing automation platform that allows you to create and automate referral marketing campaigns to collect leads via email opt-ins, offer pre-launch rewards, and minimize cart abandonment. Campaigns can be managed and organized for multiple domains, therefore the solution is suitable for companies of all sizes. You can expand your customer list with iRefer, which smoothly integrates with your website or SaaS application. Utilize the power of referrals to gain more signups and subscribers for your email list, boost e-commerce sales and SaaS subscriptions, and launch your ICO (Initial Coin Offering), airdrop, and product, and create awareness for them. Get interested people to join your waiting list and give them rewards if they refer their contacts. You can create multiple reward levels to provide incentives to visitors. Offer regular rewards or link them to your Shopify store. iRefer automatically disburses rewards after signup goals are achieved. To minimize spam signups, you can add double opt-in to your campaigns. The software automatically notifies you about fraudulent signups and allows you to remove them and prevent the visitors from trying to register again. In addition, you can select the social media networks you want to include in your campaigns, and get stats on the number of signups obtained via each channel. iRefer has 3 opt-in form styles which are embedded, chat style and modal forms. You can customize the forms to match your website design and add your desired fonts, text and background colors, images, and more. Launch your referral program, pre-launch campaign, or viral giveaway in minutes with iRefer’s ready-to-use templates or you can create your own. 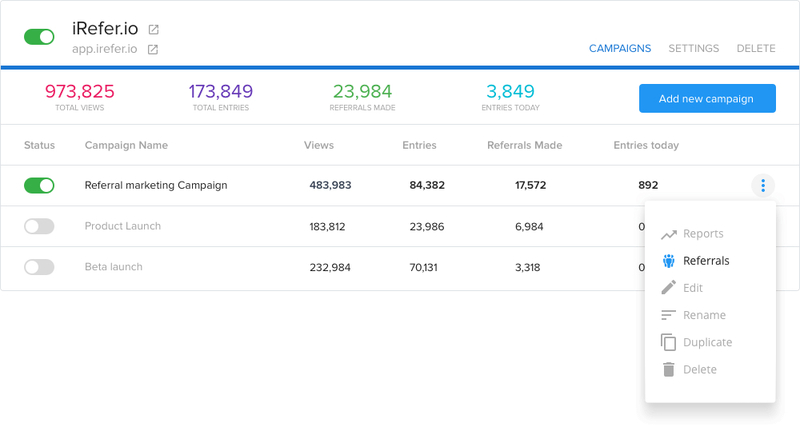 Use the tool’s robust and flexible campaign builder to create the referral campaign that way you want it. iRefer.io makes it easy and quick for your supporters to share their referral link with their contacts. You can customize your sharing messages for different platforms such as email, LinkedIn, Twitter, Facebook, and Whatsapp. You don’t need coding skills as iRefer functions out of the box with all leading e-commerce solutions and websites to provide a seamless user experience for you and your customers. Use Zapier to integrate with the applications you want or utilize the APIs to build your own custom integrations. For more information about the vendor feel free to visit iRefer website here.